"I felt like time was running out and that I had done nothing with my life. I felt like a man trying to catch the last train ... Mexico's clear air, bright colors, and warm people seemed a corrective for gray skies and anxious Americans ... I saw that my life was mere clay, not a thing carved in stone, and that with my own hands and those of Fate it might be reshaped." 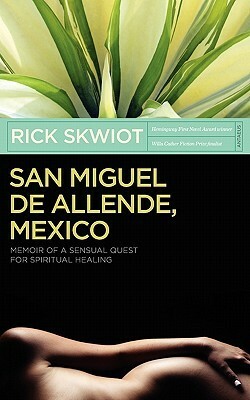 San Miguel de Allende, Mexico: Memoir of a Sensual Quest for Spiritual HealingRick Skwiot is a Tech-quila University Grad. He understands that Mexico is not just a place but a way of life. Its surreal philosophy blends "Lord help me to accept the things I cannot change" with orgies to rival Caligula. Not all travelers have the heart to get Mexico. Not all writers have the huevos to put it into print. In this multicultural era, it is not fashionable to say that Mexico is bizarre and comical. Yet it is, and Rick does. In this politically correct age, it is not acceptable to suggest that Mexico may be no more insensitively machismo than gringos are hypersensitively neurotic. Yet Rick dares to hint at this unspeakable truth.His work also sheds light on the unique pathology ... er ... I mean artistic bent that moves writers to devote decades to a career nearly as promising as blacksmithery. (I, of course, am the exception. With no wounds or chemical imbalances, I immerse myself in cigars, alcohol and putas solely for you the reader.) So, if you're interested in becoming a serious writer and/or drunk, this book can help. Let's add Rick to our tortured-artist prayer list. If anyone has his address, I'm sure he'd appreciate you giving it to some religious group for a much-needed Saturday-at-dawn doorknocking.Rick's new volume is a fast and fun read that doesn't bore or exasperate like much touted literature, but offers meaningful insight without stalling the story. Plus, he is an author who writes like a man - a species more endangered than the panda. Still, one place where this book falls short of mine is that it lacks a photo of me exuding raw animal magnetism from the back cover. (Why Rick's publisher opted against this is unclear, but I think it was a bad call.) Otherwise, I recommend this work to guys, for those times when you don't have a cold one in the fridge or a hot one on the sofa, and to ladies who like it rough - literarily speaking. Mexico is continually in the news, so you might begin reading "San Miguel de Allende, Mexico" thinking you know what the country and its people are all about. By the time you finish, you'll think again.Skwiot first traveled there when he was a spiritually disaffected young Midwesterner trying to distance himself from dark days and a barrage of North American angst. In a short time he decides to stay in Mexico because, among other reasons, he says "it penetrated me like a balm. "I was interested in this memoir because 30 years after Skwiot's journey, my son took a similar trip through Eastern Europe and Africa, seeking his own spiritual and sensual healing. "San Miguel de Allende, Mexico" helped me appreciate why young men leave home to head for unknown towns full of risk, mystery and magic.In a number of ways, this book is a man's version of Elizabeth Gilbert's "Eat, Pray, Love," but without her fat checkbook and self indulgence. Both books contain an abundance of good writing, appreciation for the local food and beverage; wine for Gilbert, tequila for Skwiot. He feasts on delicious Mexican street foods like gorditas, chorizos and picks avocados off the tree outside his window. He finds peace and new respect for religion by visiting ancient shrines, pastel-colored churches and attending a friend's wife's funeral and burial.Along the way, he introduces us to a melange of ex-pats and locals, like Ilena, an artist versed in native medicine who before his eyes, cures a sick child's fever with "a fist of dried basil stalks and a raw egg" in a glass of water. He meets Licha and Adriana, two beautiful uninhibited women with aristocratic roots who are part of Mexico's warm embrace that enabled him to begin "again to live inside my body, to live with my heart and my senses and less so merely inside my mind...."
Rick Skwiot - Rick Skwiot's new urban mystery, "Fail," is being released by Blank Slate Books in fall 2014. Skwiot is the author of three previous novels--the Hemingway First Novel Award winner "Death in Mexico," the Willa Cather Fiction Prize finalist "Sleeping With Panocha Villa," and "Key West Story"--and two memoirs: the critically acclaimed childhood memoir "Christmas at Long Lake," and "San Miguel de Allende, Mexico: Memoir of a Sensual Quest for Spiritual Healing. "He's taught creative writing at Washington University in St. Louis and served as the 2004 Distinguished Visiting Writer at the University of Missouri-St. Louis. He is co-founder and director of the Key West Writers Lab (KeyWestWritersLab), which mentors serious novelists, memoirists and poets worldwide. A veteran journalist, he also works as a feature writer. He lives in Key West, Florida, and blogs at RickSkwiot.